A few days ago, in a religious festival in Palakkad, in the state of Kerala, India, one elephant had enough. The elephant was part of the four-day regional Thalappoli Festival at the Bhagavathi Temple, one of the oldest temples in India when he decided he was done with everything. While up to 27 vehicles were damaged or destroyed, thankfully nobody was injured. 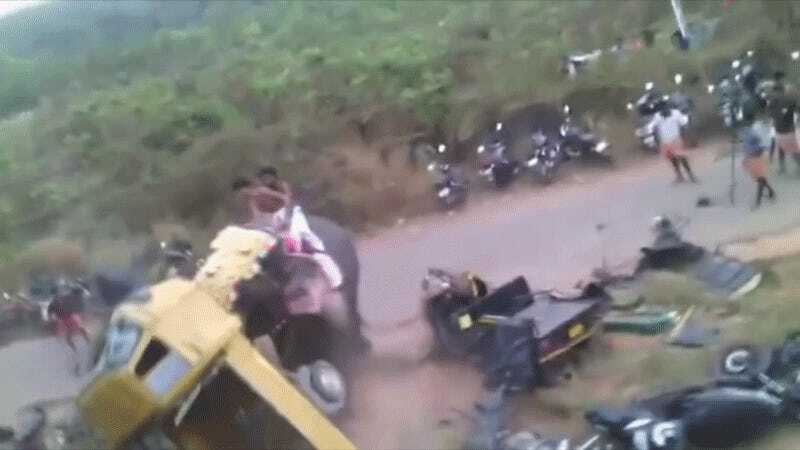 Interestingly, the elephant first attacked a motorbike, followed by an three-wheeler autorickshaw and then a tempo truck — going from two-wheelers and working its way up to four-wheelers. I guess it’s fortunate nobody was driving one of those 6x6 G-Wagens, or this could have gone on even longer. Devidasan was initially tethered, but broke free just before his rampage, with two mahouts (elephant wranglers) still on his back, helpless as the pissed pachyderm flings auto-rickshaws around like toys. It’s not clear if he has something against motor vehicles (if so, I bet we just need to find him the right one) or if he was just sick of being forced to participate in another festival. Animal rights activists have long been against the use of elephants in these sorts of observances, and while elephant involvement has a very long history in India, it’s not like this sort of thing is uncommon. I mean, I get that having an elephant involved makes for a much, much more engaging religious service than many of us in the West are used to (I’d have killed for an elephant or two at my Bar Mitzvah) but it’s hard to say that elephant involvement doesn’t come at a pretty steep price. If the elephants aren’t on board, it looks like trouble for everyone.